Question: How is the budget for technology used? Answer: To keep up with the rapid and constant change in technology, the TCE-PTA has pledged to update the technology equipment at Turner Creek Year Round assuring that our students have latest digital innovations available to them. Each year one grade receives new equipment for each classroom; Smartboards, ipads, Notebooks, etc.. The TCE-PTA has funded over $60,000 in technology equipment over the past three years. This support would not be possible without the generosity of our Turner Creek families and community! Question: How to join the Turner Creek Elementary PTA? Answer: The TCE-PTA Membership Drive ends August 31. Our goal this year is to have 100% of our Turner Creek families join! We are almost there! If you have not yet joined, help us reach our goal! Join online below using PayPal® or download the paper form here. If you would like to join and it just does not fit in your budget this year, please contact Leigh Ann Miller. A limited number of sponsored memberships are available. 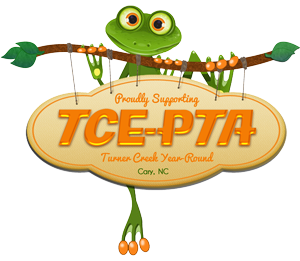 Thank you to those that have taken the time to show your support of Turner Creek Year Round and joined the TCE-PTA this year! Right here, right now, it's a great place to be! !